As a complement to PopMatters' "Nevermind Nostalgia" retrospective on music in 1991, Sound Affects takes at look at a partial selection of the year's hip-hop highlights that lean more towards beats production than the era’s increasingly popular gangsta genre. The year 1991 was one of astonishing riches in hip-hop, landing (depending somewhat on your definition) somewhere in the middle of the genre's "golden age". Building on the innovations of Marley Marl, Ced Gee, and others, the producers of the early '90s -- among them Pete Rock, Diamond D, Large Professor, and DJ Premier -- built complex sample-based productions and drew from a palette that included increasingly obscure soul jazz, jazz-funk, and R&B cuts -- and did so in an atmosphere of ferocious innovation and competition. At the same time the gangsta genre narrowed hip-hop's militant political street ethic -- epitomized previously by politically conscious stances of Boogie Down Productions and Public Enemy, among others -- but the resulting controversy took the genre to a wider market. Among the year's releases were debuts from Organized Konfusion and Freestyle Fellowship; Public Enemy's Apocalypse 91... The Enemy Strikes Black; KMD's Mr. Hood, UMC's Fruits of Nature, Pete Rock & C. L. Smooth's All Souled Out EP, and follow-ups by Geto Boys, Ice Cube, and much more. What follows is, necessarily, a highly partial selection of the year's highlights. If it leans more towards beats production than the era's increasingly popular gangsta genre, perhaps that is because hip-hop's militancy reinvents itself every few years -- with a canny eye on the genre's commercial opportunities -- whereas the time's layered production innovations remain relevant in a work of digital audio tools such as Pro Tools, Cubase, and Reason. Foremost among 1991's superlative beatcraft is Main Source's LP Breaking Atoms. Astonishingly out of print for more than ten years until 2008, Breaking Atoms was the product of producer/MC Large Professor and Canadians Sir Scratch and K-Cut. It's hard to pick a standout track from the album, with highlights such as "Just a Friendly Game of Baseball"--a tale of police brutality marching across the top of the mainstay Lou Donaldson "Pot Belly" sample. "Peace Is Not the Word to Play", like "Snake Eyes" or "Just Hangin' Out", is comprised of samples so densely intertwined that it is only with attentive headphone listening that the songs' distinct components are revealed. "Live at the Barbeque" introduced Nas to the world: ostensibly an MC cut, Nas's taut delivery ignites the song from its first verse, signalling the talent that would flow into Illmatic in 1994. 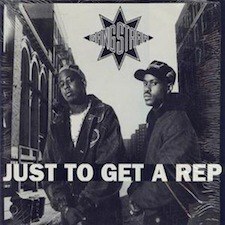 A wall of textbook DJ Premier productions--tight, perfectly focused, impulsively looped creations--Gang Starr's second album, Step in the Arena, was modestly reviewed upon release. But songs like "The Meaning of a Name" and "Beyond Comprehension", with its reversed opening--a brilliant transformation of a fragment from Soul II Soul's "Keep on Movin'"--show the kind of textural experimentation that kept Premier in the front ranks of producers, alongside the crowd-pleasing loops of "What You Want This Time?" and "Love Sick". Guru's lyrics remained clear, open, and effortlessly confident. At their best, the contrast between their styles was there if you were listening for it but disappeared into the pure strut of their sound. Guru was full-on and braggy in "Step in the Arena", Premier stripped-back and dusty. In "Just to Get a Rep", Premier bounces around a loop from Jean-Jacques Perry's kitsch organ LP Moog Indigo, while Guru is chillingly casual as he describes a stick-up kid's pursuit of a victim. "Brothers are amused by others brother's reps / But the thing they know best is where the gun is kept". 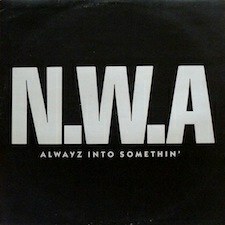 Three years after initiating the gangsta genre with Straight Outta Compton, NWA returned in 1991 with Efil4zaggin, without Ice Cube but with some caustic responses to his departure over a royalties dispute. From that album, "Alwayz Into Somethin'" was one of the earliest examples of Dre's G-Funk style, slower and almost washed out by hazy synth lines, a sound which was later to be explored extensively in The Chronic and, indeed, exhaustively, across the first half of the 1990s. Remarkably catchy, built off a Melvin Bliss beat and supported with a Jackson 5 sample, "O.P.P." was everywhere in late 1991, in spite of its lyrical content; and it still recurs on film soundtracks with striking frequency. "The Wacky World of Rapid Transit"
Del was only 18 when I Wish My Brother George Was Here was released under the tutelage of Ice Cube. George is more heavily determined by a P-Funk influence than the later Hieroglyphic records like Del's No Need for Alarm, Casual's Fear Itself, or Soul of Mischief's 93 'til Infinity, which show a muscular awareness of space in contrast to the tight and busy funk of this album. But there are hints of it on "Dark Skin Girls" and elsewhere. And songs like "Pissin' on Your Steps" and "The Wacky World of Rapid Transit" rumble and clatter in a series of brilliant collisions of sample and riff and lyric, diced with Del's off-kilter perspective .